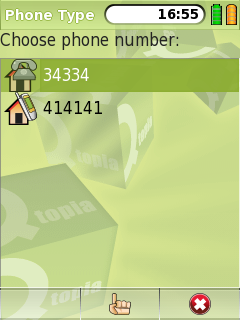 The QPhoneTypeSelector class provides a way of selecting a single type of phone number. The phone number types correspond to those defined in QContact::PhoneType. It can be used in one of two ways - either to allow the selection of one of a QContact's existing phone numbers, or to allow the user to pick the type of a new phone number (for example, to save a phone number as a 'work mobile' number). Choosing a phone number type for a new phone number. Note that the existing phone numbers for the QContact are displayed. Constructs a QPhoneTypeSelector dialog with parent parent. 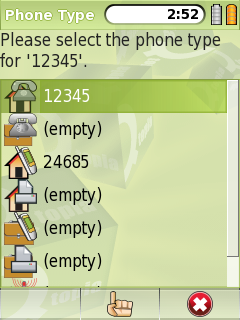 The dialog will show phone numbers and phone number types from the given contact. To choose an existing phone number from a contact, pass an empty string as the number argument. To choose a phone number type for a new phone number, pass the phone number as a string as the number argument. In the second case, the dialog will show any existing phone numbers for the contact in addition to the available phone number types. In the second case, the dialog will show any existing phone numbers for the contact in addition to the available phone number types, restricted by the set allowedTypes. If allowedTypes has zero length, the entire set of possible types is allowed. Returns the QContact::PhoneType that is selected in the dialog. If no phone number type is selected, this will return OtherPhone. This signal is emitted when the user selects a phone number type. Returns the contact's phone number that corresponds to the phone number type selected in the dialog. Updates contact to have the given number for the dialog's selected phone number type.